iLoveToCreate Blog: Make your own DIY Glitter Shoes! Make your own DIY Glitter Shoes! 1. Cover work surface with plastic tablecloth. Set shoes on prepared surface. 2. Squeeze out Glitter bond onto foil. Using paintbrush or make-up sponge apply glue to shoes. 3. Once desired areas are covered, immediately cover with Fashion Glitter. Optional: Use glitter bond and paint over glittered areas to seal. Tip: Lay paper towel down underneath shoes while applying glitter, shake excess glitter onto paper towel then back into glitter bottle. 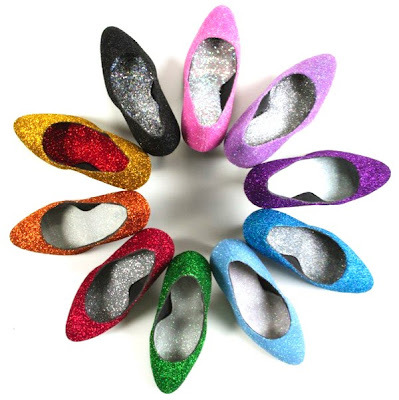 Note: We used these glitter shoes for display, so that’s why you see the glitter on the inside of the shoes too! We don’t recommend this for wearing, but they would make a fun wall motif like shown or accents and art to make your space super girly and fun! I love them!!! Will have to glitter up a pair of mary janes for my babygirl! Glitter me happy! I love the blue ones. They look like sparkly icicles for your feet! yes! please! i once sequined a pair of shoes... ruby slippers i might add, but this looks 357% easier!!! and still really fun! These are AWESOME! gonna have to get to the thrift store and find me some shoes to revamp! thanks for the great ideas! New follower and I"m so excited I saw this tutorial!!! I need to repair my 4yrs old glitter shoes that my daughter has worn out! Thanks for sharing the the tip about Tulip Fashion Glitter! Looks what I know I'll be buying up this week! Thanks!! great shoes! love the style and design of them. I just made some black and green glitter shoes. I can't wait to wear these. Thanks for the idea and tips and tricks!! Is there a specific shoe material that is best for glittering? any tips to keep it from getting this way? This is such a fun idea! Those shoes are pretty. I want to have a glitter shoes now.